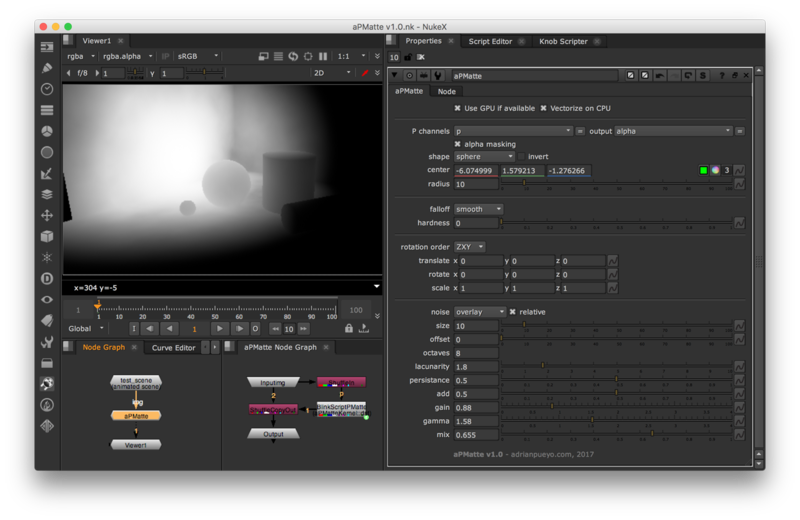 aPMatte is a Blinkscript based gizmo to generate a matte from a Position pass on your GPU, with extra options to transform it and to add a 4d noise overlay to make your matte look more organic, or simply output the nice p noise that sticks to your scene. Feedback, bugs and suggestions appreciated. Hope you find it useful! Hola! Really nice noise feature. I'll test it in, and w'll let you know how it goes. Thanks! Hey Adrian! your gizmo is really impressive ! I just feel that when it samples it has a slower response in comparison to the other ones. but besides that is a really good one thanks!